The tonsils are a pair of oval-shaped tissues in the back of the throat. The tonsils come into frequent contact with germs, making them prone to infection. Viruses and bacteria, especially the Streptococcus bacterium (responsible for strep throat), are the most common causes of infection. Other causes include adenoviruses, influenza, Epstein-Barr virus, enteroviruses and herpes simplex virus. Sore throat and swollen, inflamed tonsils that may appear red with a white or yellow coating are the most recognizable symptoms of a tonsil infection. Other signs include blisters on the throat, swollen glands in the neck or jaw, difficulty swallowing, fever, headache, chills, fatigue, ear pain and bad breath. 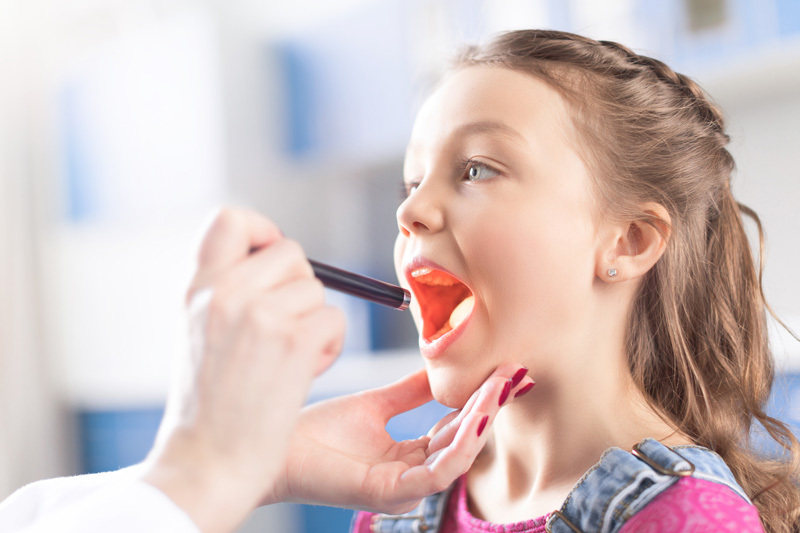 Diagnosing a tonsil infection requires a physical examination with an in-depth exam of the throat and ears. Surgical removal of the tonsils, known as a tonsillectomy, is for chronic cases that do not respond to other forms of medical treatment. Home remedies are usually recommended for infections caused by a virus. Your child should get plenty of rest and stay hydrated with fluids. Warm broth or tea and cold Popsicles are particularly effective at soothing pain and discomfort.